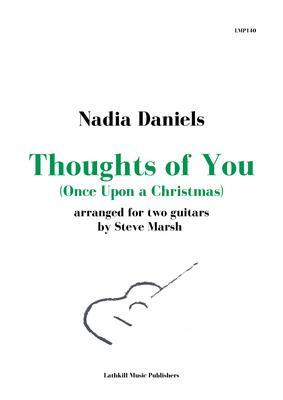 Thoughts of You was composed for piano towards the end of 2016 by Nadia Daniels. It was written as a Christmas present (hence the sub-title) for her husband, Steve Marsh, who subsequently arranged the work for two guitars. The composition is a very beautiful, melodic piece which works wonderfully well on two guitars and is ideally suitable for the Intermediate guitar duo. At the age of 12, Nadia Daniels taught herself the classical guitar and later studied clarinet, recorder and piano at Trinity College of Music, London. Over the years she has been involved in various music groups including orchestras, choirs, recorder groups and chamber ensembles. She has since studied classical guitar with Selena Madeley, Mark Ashford, Steve Marsh and Peter Katona and in 2016 she began playing the cello. She regularly performs classical guitar duet concerts in partnership with Steve Marsh.